We hope your plans are to visit us soon as you'll quickly discover our beachfront hotel offers guests the perfect location for family vacations or just pure romance. Boasting exhilarating views of the Atlantic, our beachfront hotel unites contemporary style with the relaxed, casual atmosphere for which this beach city is so famous. We promise you will not be disappointed. Renowned for its convenience, beautiful location and beachfront affordability, the Holiday Inn Oceanfront is moments away from all that is Surfside-Myrtle Beach: vibrant shops, fine restaurants, local attractions, 100+ championship golf courses, a myriad of outdoor sporting activities, and well, everything you can imagine for the pampering of your life. So why not let our dedicated associates help you arrange your next trip, whatever the occasion might be. 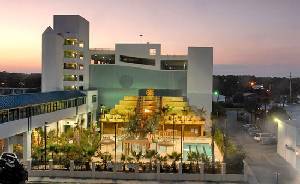 Find out first hand why we are often referred to as the Hidden Treasure of Myrtle Beach! Stay the night in our classically comfortable hotel accommodations and indulge in personalized service at an unbelievable beachfront location. Rest your head on our plush bedding after a long day lounging on the beach or visiting the many nearby Myrtle Beach attractions. Stay connected with colleagues from your oceanfront balcony and tap into our complimentary high-speed wireless internet. Feast on delicious fare in our onsite restaurant or enjoy a beverage of your choice at our lively Tiki Bar. Tiki Bar, an oceanfront experience you won't want to miss - serving dinner nightly and offering Happy Hour drink and appetizer specials. 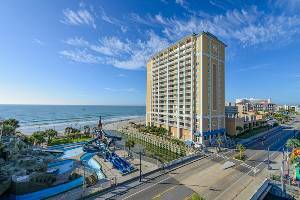 This delightful family friendly oceanfront high rise resort is situated on south end of Myrtle Beach. With so many wonderful amenities you may not want to leave the resort, but if you do there are plenty of nearby attractions. Enjoy venturing out to close by fun including Family Kingdom amusement Park, Broadway at the Beach, Myrtle Beach Convention Center, Midway Park, Art Museum of Myrtle Beach, Mount Atlanticus Miniature Golf and SkyWheel Myrtle Beach. Situated just a mile inland near the heart of Myrtle Beach, Myrtlewood Villas offer their guests unbeatable vacation condos to rent for a Myrtle Beach vacation! Myrtlewood Villas provides spectacular amenities for guests to enjoy during their Myrtle Beach vacation including multiple indoor/outdoor pools, Jacuzzis, a lazy river, exercise facility, group pavilions with BBQ areas and two on-site golf courses. With so much to do on-site and great location near the coast and all the hottest Myrtle Beach attractions, a vacation at Myrtlewood Villas is sure to be perfect for you and your guests! 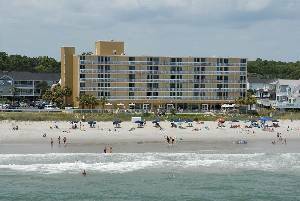 The vacation rental condos of Myrtlewood Villas are sure delight guests. Featuring the communities of Magnolia Place, Magnolia North and Magnolia Pointe, an extensive inventory of comfortable accommodations is available. Each rental condo features modern conveniences like fully-equipped kitchens, multiple TVs with cable and washer/dryer combinations. The Myrtlewood Villas are also beautifully situated with private balconies that look out over the area scenery. Groups of any size will be easily accommodated. Mangolia Place offers one bedroom condos and two bedroom condos, while Magnolia North and Magnolia Pointe provide one bedroom condos and two bedroom condos. Many rental condos feature lake or golf course views, with other condos having pool views. All vacation condos are professionally designed with modern decoration and are sure to be clean, comfortable accommodations for various group sizes. It's no wonder why so many Myrtle Beach visitors return year after year to Myrtlewood Villas for their Grand Strand vacation! When it's time to check out the sights and sounds of Myrtle Beach, everything is within convenient driving distance from your condo. Just a block down resides Broadway at the Beach, the premier shopping, dining and entertainment district in Myrtle Beach. Featuring Ripley's Aquarium, Hard Rock Caf and Wonderworks, over 300 acres of attractions are sure to fill your vacation with fun! Other area favorites nearby include the attractions of the Myrtle Beach Boardwalk, Myrtle Waves Water Park, Family Kingdom Amusement Park. Great North Myrtle Beach attractions are also easily accessible, with places like Barefoot Landing, Alligator Adventure and the House of Blues all only a short drive north. With so much to do, there's no such thing as a dull Myrtle Beach vacation! 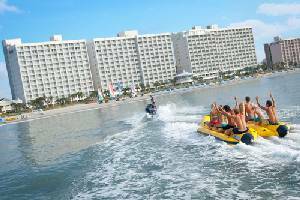 If recreation is what you seek, you'll find it almost everywhere during your Myrtle Beach vacation. Known as the Golf Capital of the World, over 80 area courses offer a diverse and nearly limitless number of options for golfers of all skill levels. Baseball fans can take in a game at Ticket-Return.com Field, home of the Myrtle Beach Pelicans, class A affiliate of the Texas Rangers. Beyond that, from beachfront horseback riding to jet ski rentals to multiple area walking and bike trails, your Myrtle Beach vacation is bound to be filled with excitement! The fun of a Myrtle Beach vacation doesn't stop there! Shoppers will be delighted by the area options before them, including two huge Tanger Outlet centers, two area malls and upscale boutiques located at the Market Common. Of course, a long day of deal hunting along the Grand Strand is bound to work up an appetite, and Myrtle Beach has you covered. From steak and fresh local seafood to BBQ and burgers, over 1,600 local eateries will fill even the biggest appetite with delicious and limitless entree options. Whatever is your idea of a perfect meal, you're guaranteed to find it on your Myrtle Beach vacation! 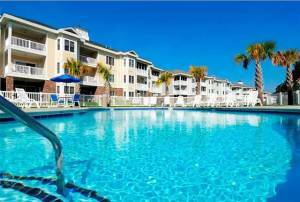 Relax On Incredible stretches of Beach Located on the Coastline in the Heart of Myrtle Beach, South Carolina. This Oceanfront Property Offers a Relaxing Beach Atmosphere Only Minutes from All the Exciting Attractions.